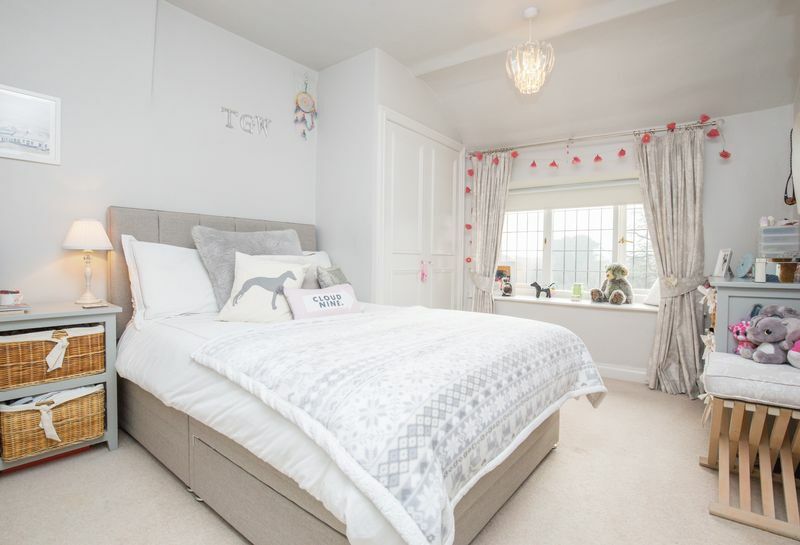 A rare opportunity to purchase this exquisite property, revealing a stunning interior and flexible layout which is sure to suit a variety of purchasers. 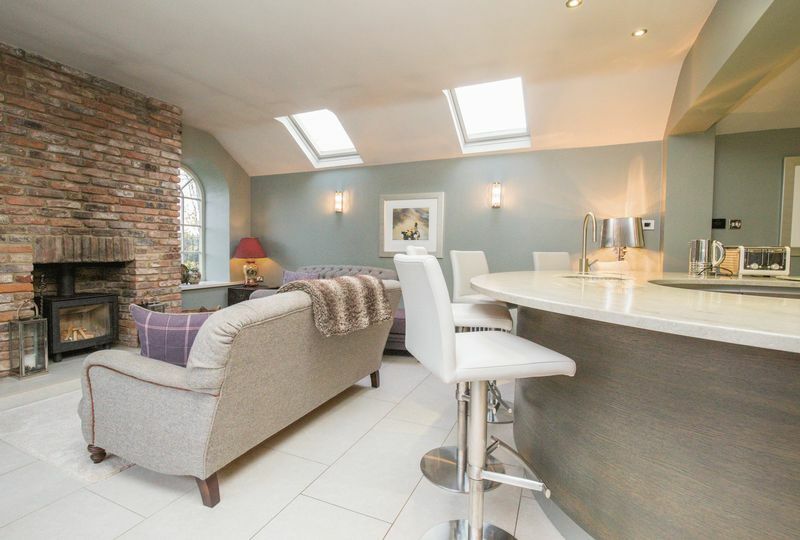 The property offers the perfect mix of traditional and modern, the main house boasting many period features, whilst the side extension incorporates a modern twist with a contemporary kitchen and living space. 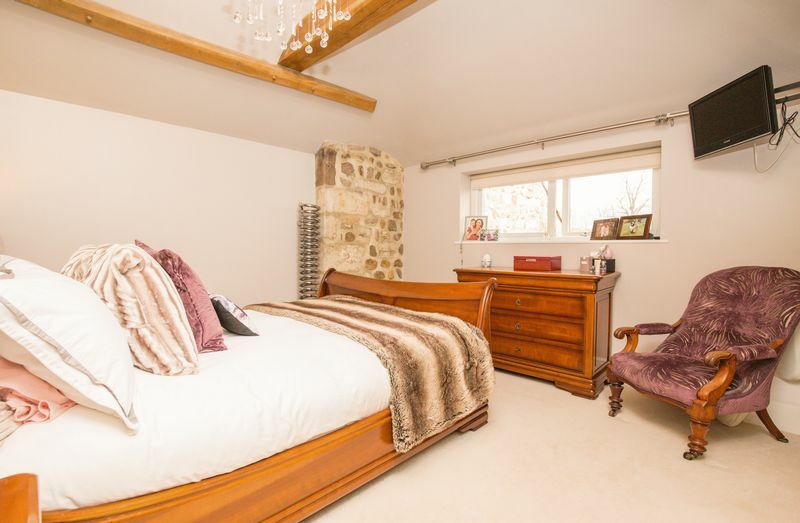 The property is currently split, with a four-bedroom house and separate one-bedroom holiday cottage. 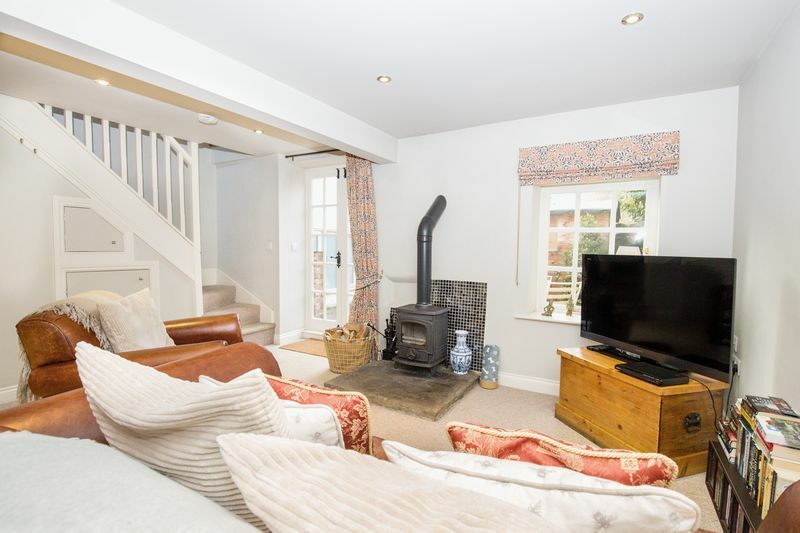 Whilst the popular holiday cottage brings an instant income stream, the option is there to open the properties into one and a door way is already in place between the two, this would create a five bedroom house of approximately 2500 square feet. 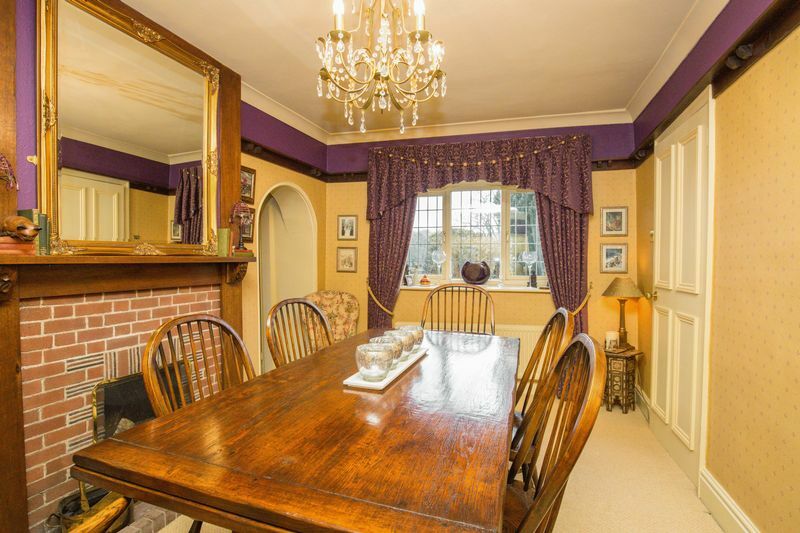 The cottage could also be used to accommodate an elderly relative, even more so with it having its own courtyard garden. The main house comprises: entrance hall, cloakroom/WC, inner hallway/utility, cosy living room with fireplace, dining room, open plan kitchen/diner/family room, snug/office and bedroom 4 (could be used as a further reception room), landing, master bedroom with fitted wardrobes and concealed en-suite, guest bedroom with en-suite, bedroom three with fitted wardrobes and the house bathroom. 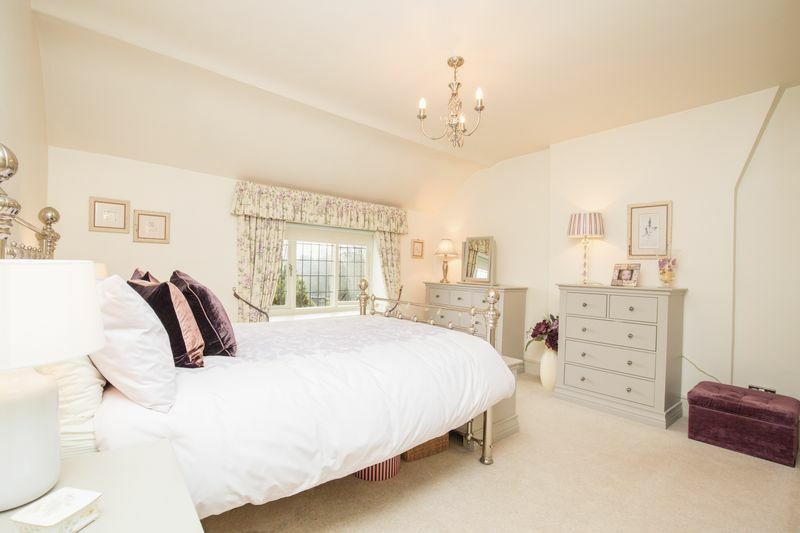 The cottage comprises an open plan kitchen and living space, the living space offering a wood burning stove and double doors to a private courtyard garden, whilst the first floor offers a very spacious double bedroom with en-suite facilities. Externally there is a cottage garden to the front of the main house, plus a private landscaped enclosed garden to the rear and side. 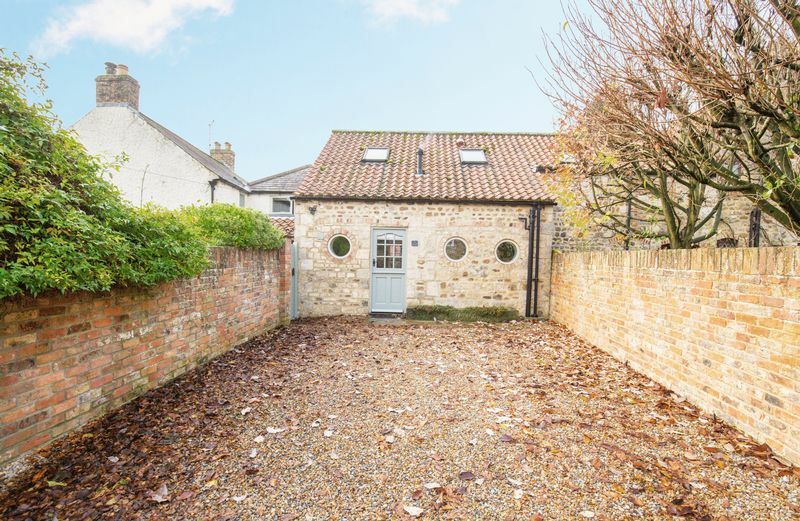 A gravelled driveway provides parking for both the main house and holiday cottage, there is also scope to build a garage/carport subject to necessary planning consents (planning has previously been passed, but since lapsed). 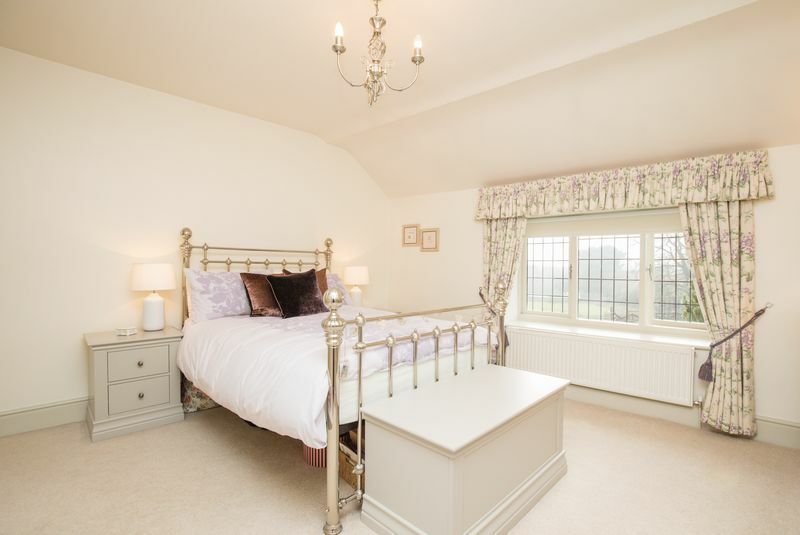 No expense has been spared throughout this beautiful home, with the highest quality fixtures and fittings used, including Villeroy and Boch bathroom fittings. 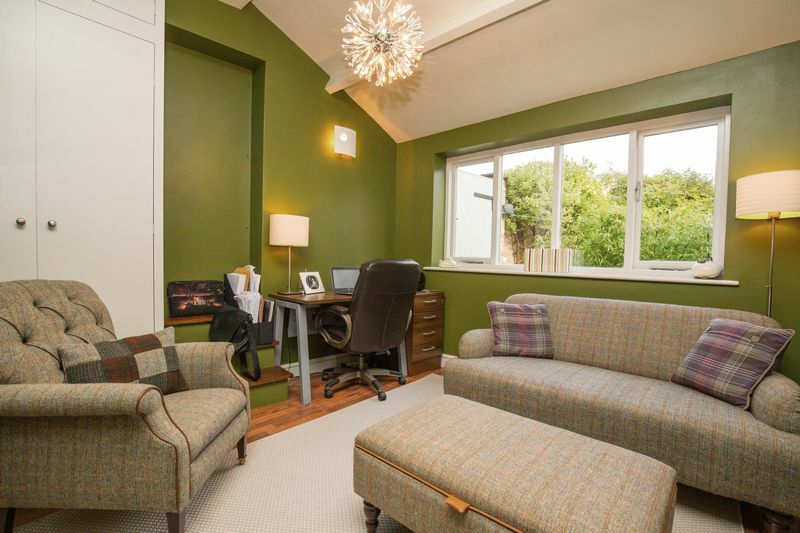 If you are after a character home with a contemporary twist, this property must be viewed. 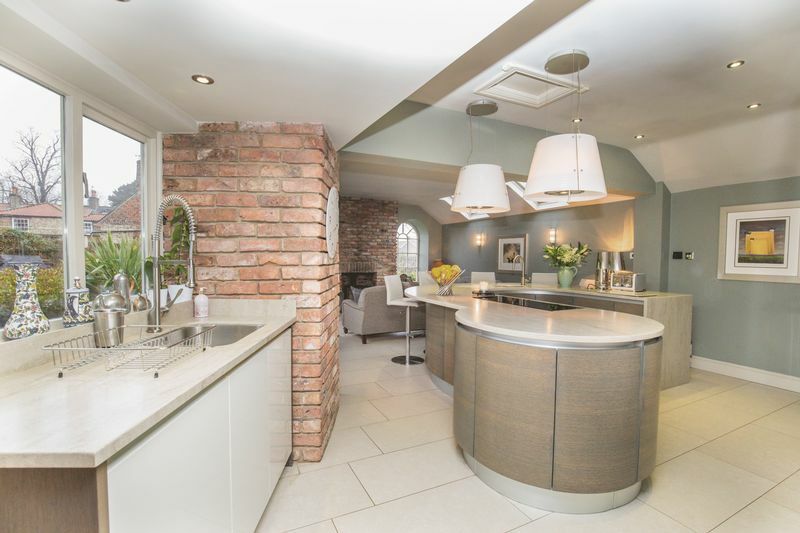 A stunning open plan living space, fitted with a very high quality kitchen and offering Schuco bi-fold doors to the rear garden, making the space ideal for social events and entertaining. The kitchen of dreams, supplied with no expense spared, approximately three years ago by Townhouse Design. 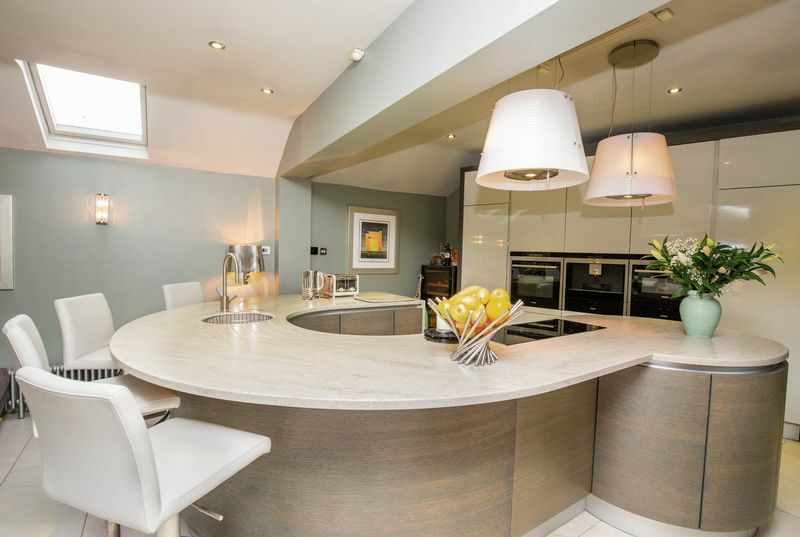 Not just for show, the kitchen offers great functionality, with a vast range of carefully planned units and adequate preparation area with an expanse of corian work surfaces. The kitchen comes fully equipped with integrated Siemens appliances, including an eye level oven, further microwave/combo oven, warming drawers, coffee machine, larder fridge and dishwasher. There is also an induction hob with two Venetian glass extractor fans over. 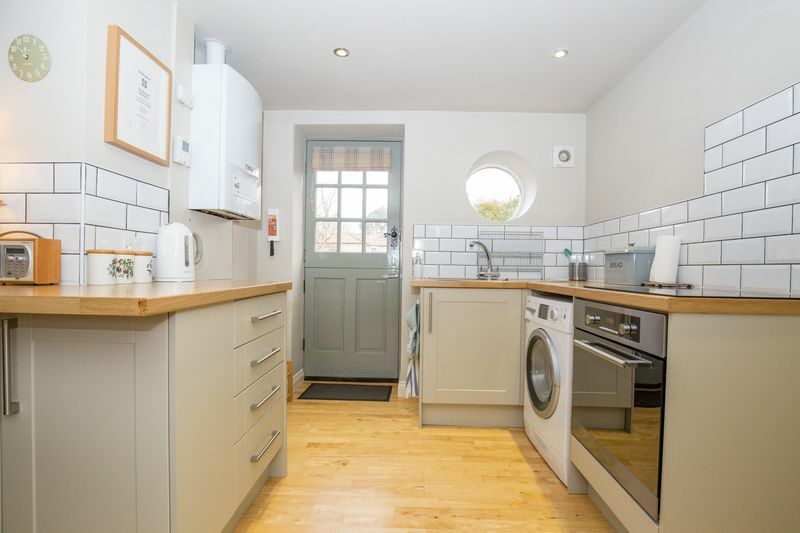 There is a circular sink and a further large inset sink to the wash area, both with mixer taps. The kitchen also incorporates breakfast/entertainment seating. There are exposed brick feature walls, window to the rear elevation and tiled flooring which continues into the living space. 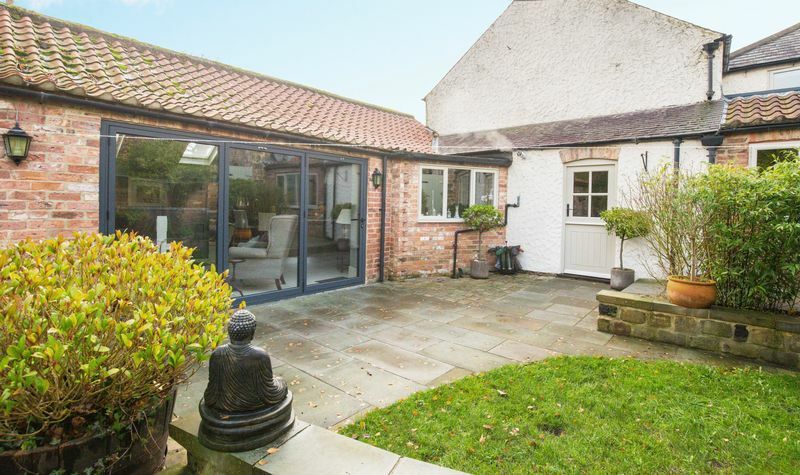 A light and airy living space, with a feature window and skylights to two elevations, whilst the bi-fold doors let the space flow seamlessly into the garden. 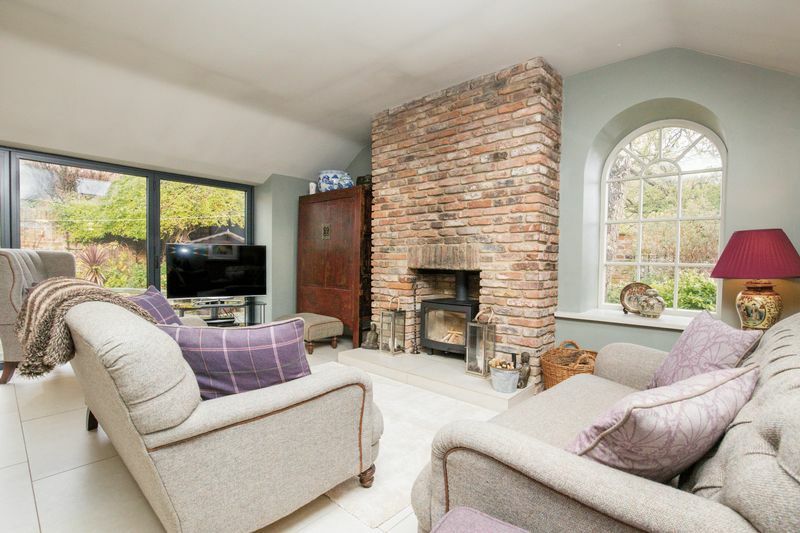 A large brick fireplace houses a Contura wood burning stove with stone hearth. 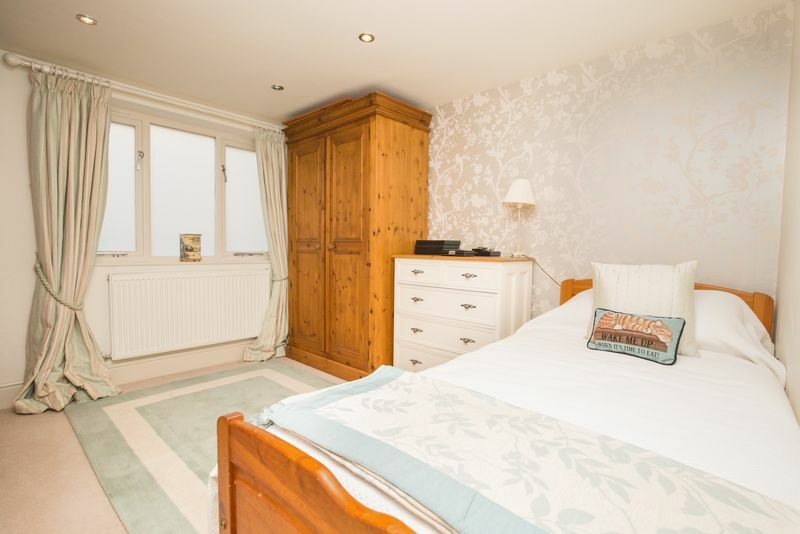 There is underfloor heating throughout, whilst two chrome Italian radiators complete the look. 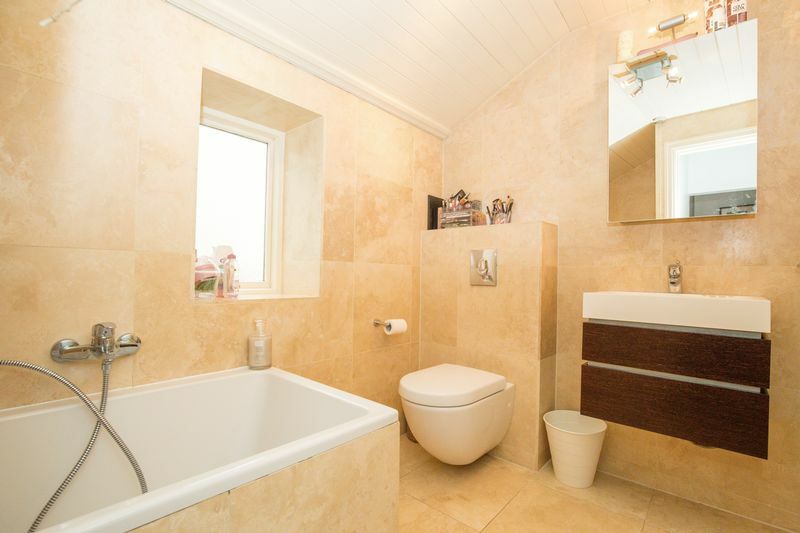 Circular sink with mixer tap and storage unit below, toilet with concealed flush, central heating radiator and tiled floor. 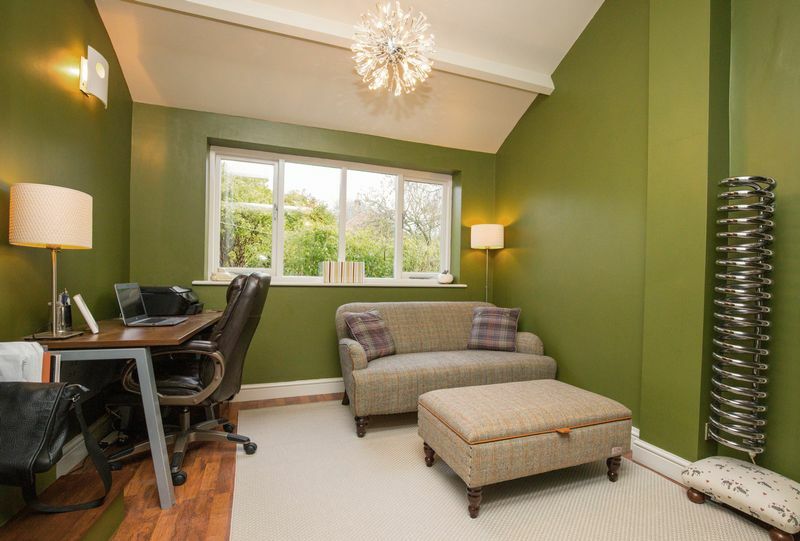 Window overlooking the garden, feature central heating radiator and underfloor heating, extensive range of fitted storage cupboards, step and doorway leading to the holiday cottage (currently blocked off, but easily opened up). Frosted window to the rear elevation, central heating radiator, window from the hallway. 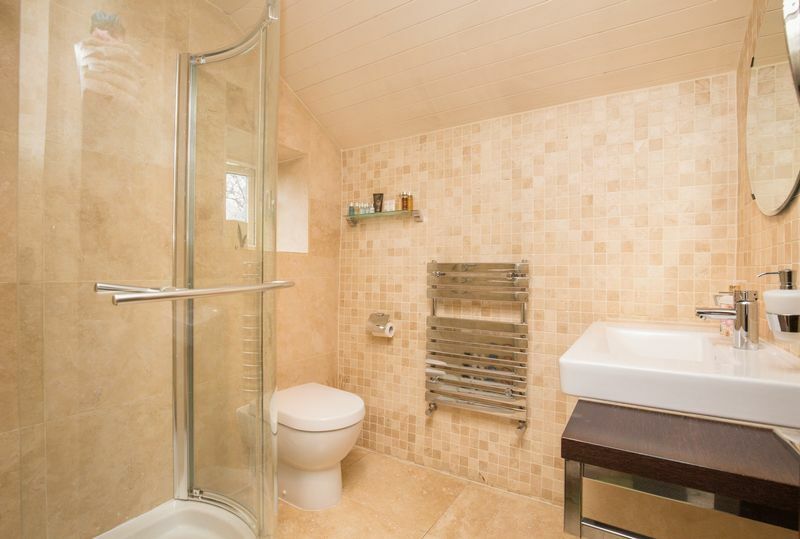 Window to the side elevation, fully tiled to walls and floor with underfloor heating, white suite comprising a wash hand basin, toilet with concealed flush and corner shower cubicle, chrome heated towel rail. Skylight to the side elevation, fully tiled to walls and floor with underfloor heating, fitted with a stylish white suite comprising a circular wash hand basin with wall mounted storage unit below, wall mounted toilet with concealed flush and a shower cubicle with glazed door, feature chrome central heating radiator. Central heating radiator, two fitted storage cupboards (one housing the gas central heating boiler), window to the front elevation offering an open aspect. 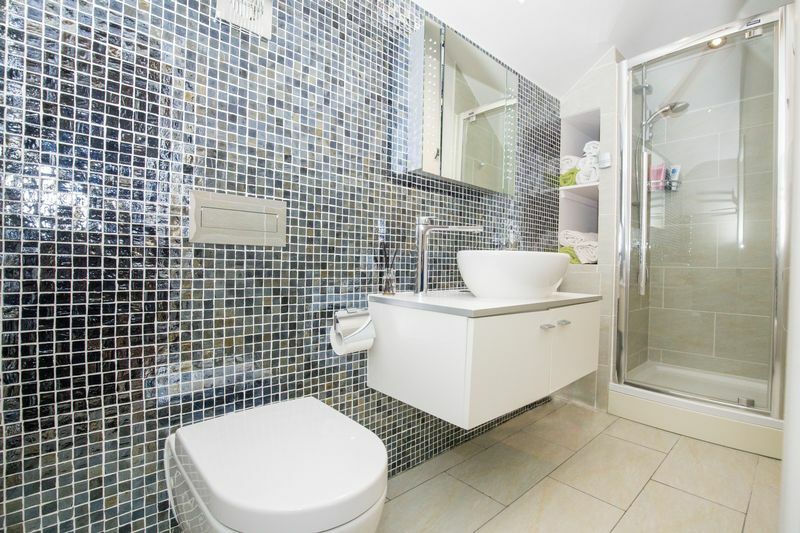 Fitted with a modern white three piece suite comprising a wash hand basin with storage unit below, wall mounted toilet with concealed flush and a bath, fully tiled to walls and floor with underfloor heating, chrome heated towel rail. 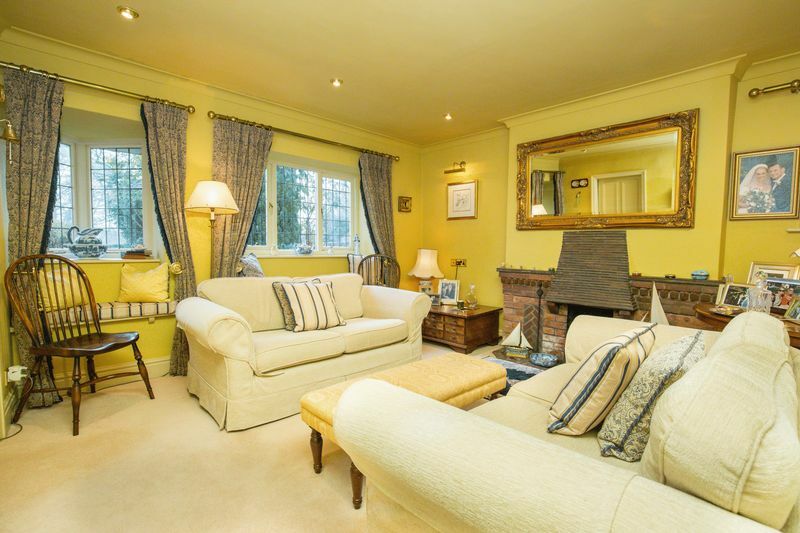 Offering a double aspect with two circular windows to the front elevation and a further window overlooking the courtyard garden, glazed double doors also give access to the garden, Aga wood burning stove with stone hearth, two central heating radiators, stairs rising to the first floor with under stairs storage. 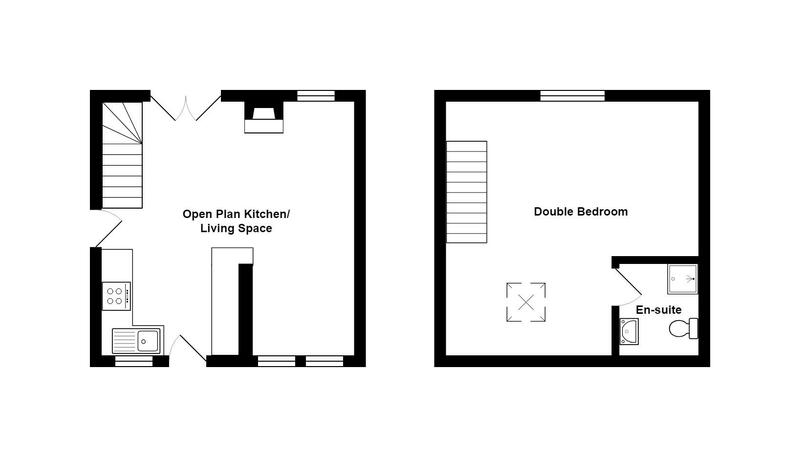 Fitted with a white suite comprising a wash hand basin, toilet and shower cubicle with glazed screen, tiling to floor and splashbacks, chrome heated towel rail, skylight to the front elevation. The main house enjoys a cottage garden to the front, with walled boundaries and being well stocked with numerous trees a shrubs. A pathway leads to the main entrance door. 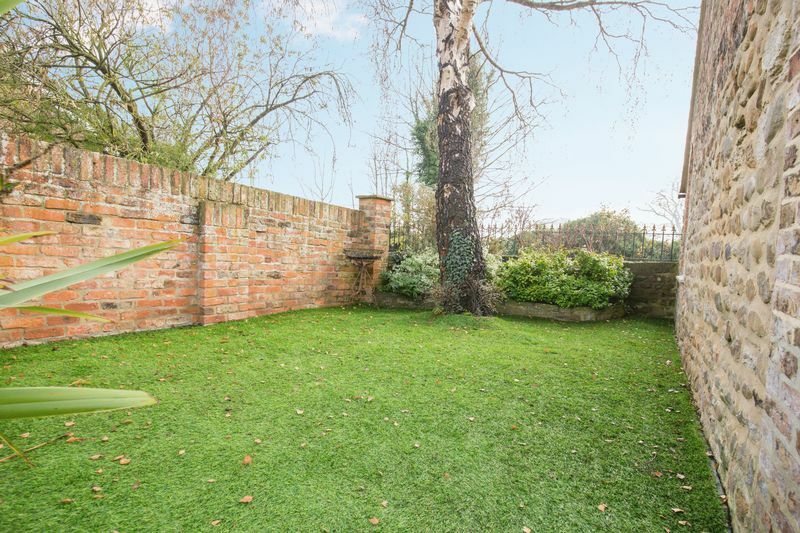 To the rear of the house there is a lovely landscaped garden, enclosed by walled boundaries and offering a good degree of privacy. 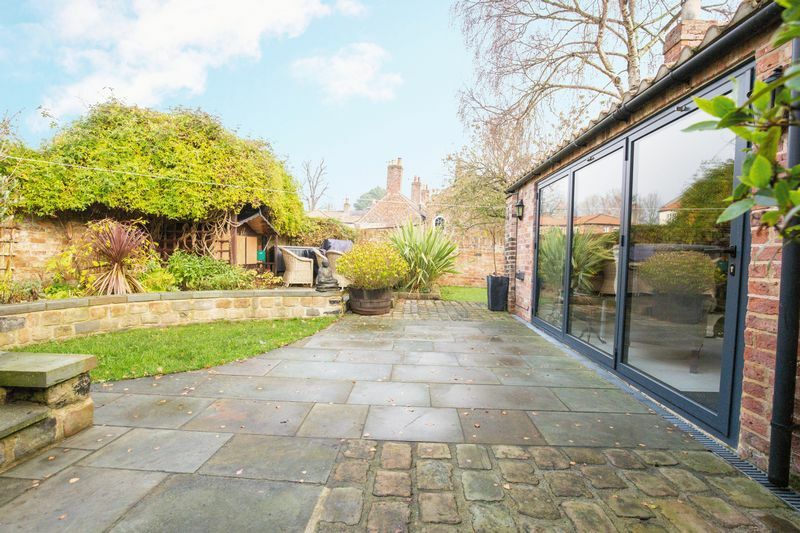 There is a large patio area which flows from the internal living space, whilst there is also artificial and natural lawn areas. 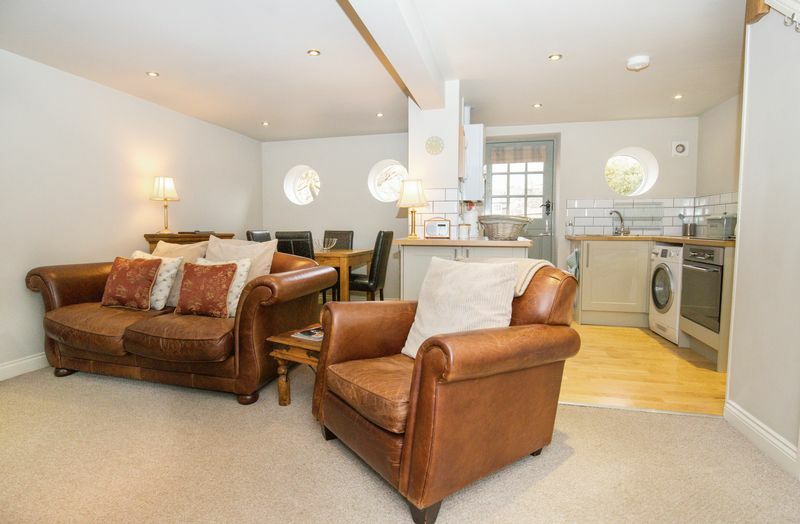 There is a further raised seating area and a gate gives access to the driveway and in turn, the holiday cottage. 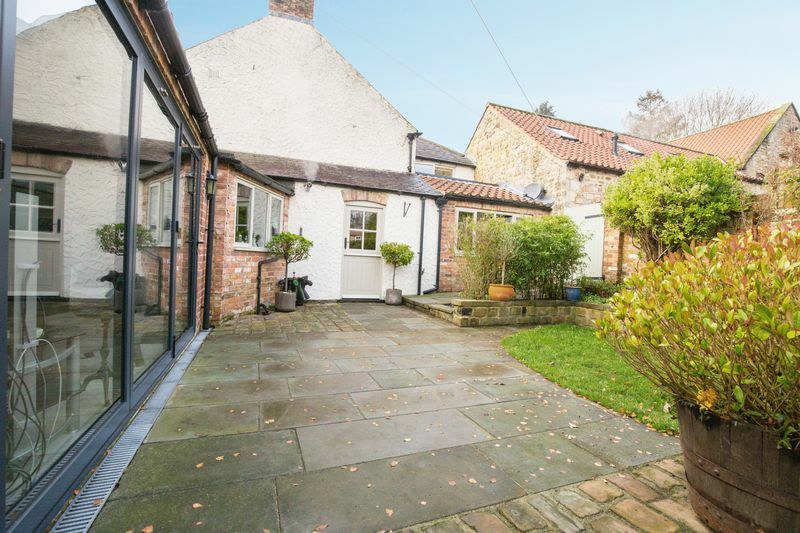 There is a spacious gravelled driveway, providing parking and offering the scope to build a garage/car port, planning permission has previously been granted, but this has since lapsed. 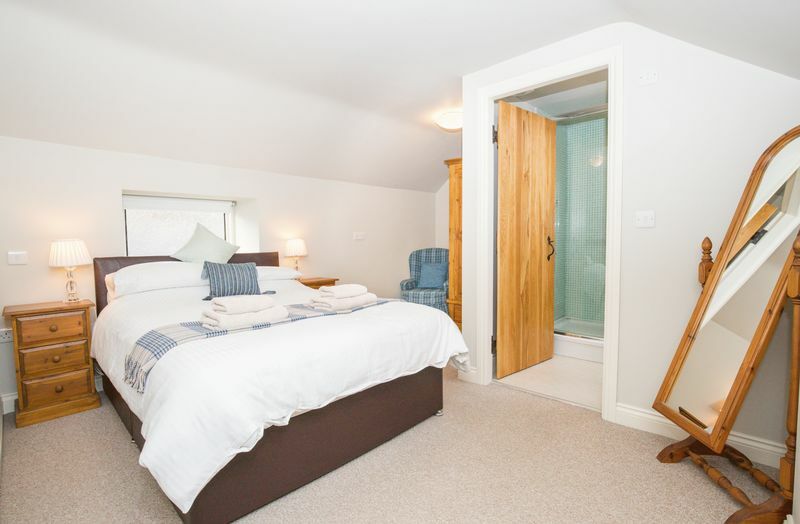 To the rear of the holiday cottage there is a further enclosed courtyard garden with a large storage shed, being designed for ease of maintenance and once again offering a high level of privacy. 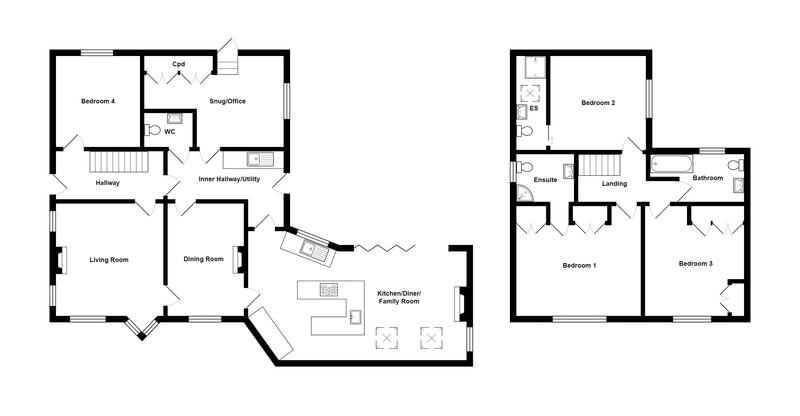 Due to the unusual shape of the building and angled rooms, measurements should be taken as a guide only. 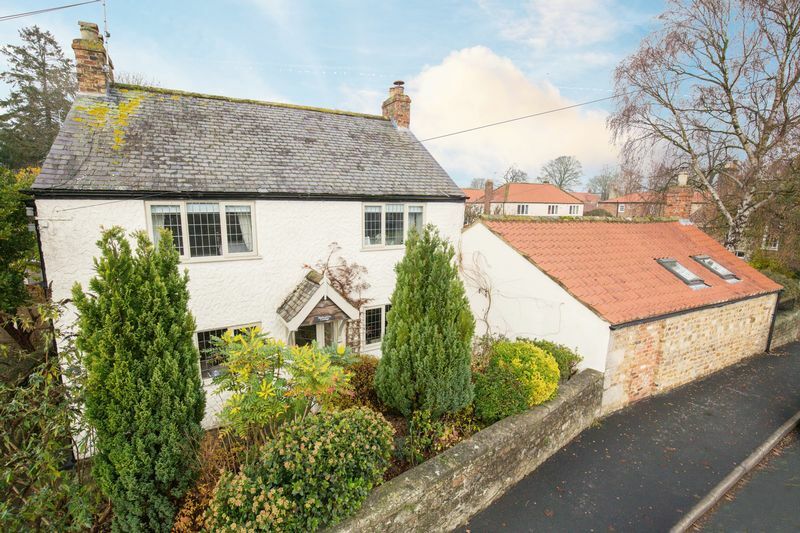 The cottage located next to Bishopton Cottage is under the same ownership and whilst this cottage is not offered on the open market, purchase of this dwelling is possible by separate negotiation, please contact Davis & Lund to discuss further.